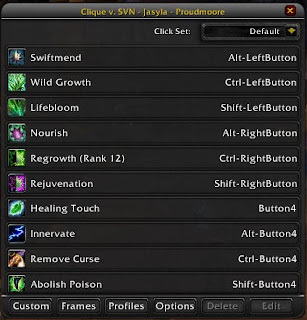 Clique is my go-to mod for all of my healing spells. It is a very simple mod to set up. Open your spellbook and you will see an extra tab for Clique. I do all my healing using Clique in combination with Grid. With this setup, you never have to target the person you want to cast a heal on, you just need to mouseover their box on grid, and do the appropriate click for the spell you want to cast. This makes healing, especially raid healing, very efficient. If you are not used to clicking or mouse-over macros this might feel awkward at first, but soon enough it will become second nature. BindPad is a mod I just started experimenting with recently. Since the use of Clique is so ingrained in my playstyle, using keyboard bindings feels a little awkward. Setting up BindPad is simple. Type /bp to open up the menu. There are separate pages for each of your specs. 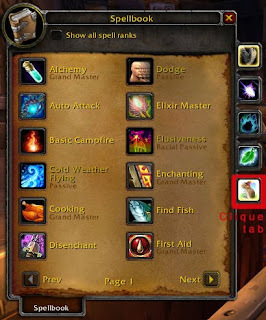 Just drag the spell you want to bind into one of the empty slots from your spellbook or your macro list. Click on the spell and you’ll be asked to press the key you want to bind it to. Right now, my druid mainly uses Bindpad for for my life-saving abilities like health stones, barksin and health pots. However, since keybinds are new to me, I still sometimes have to think before using them. Because of this, I still have these abilities on my action bars just in case. 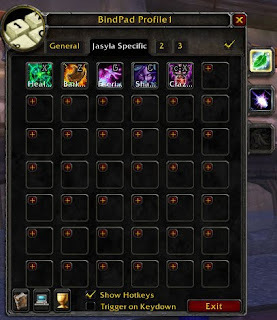 I hope to make more extensive use of Bindpad on my hunter so I can clear some more abilities off my bars.